Yahoo Answers is a great way to promote your business and get natural traffic to your website. I'm doing Q&A related work in Yahoo Answer for last 5 years inside and outside Seoclerk. So I will do my best to get the most of it in order to get you as much traffic as I can. I have many Yahoo Answer accounts with diverse levels and all accounts are capable of posting clickable links. If any of the answers get deleted, just inform me then I will immediately replace it with the New One. Firstly I will search for opened questions relevant to your website and then I will post quality answers in order to attract visitors to your website. No shortened URL will be used. Full homepage URL will be used and it will be 100% clickable link. 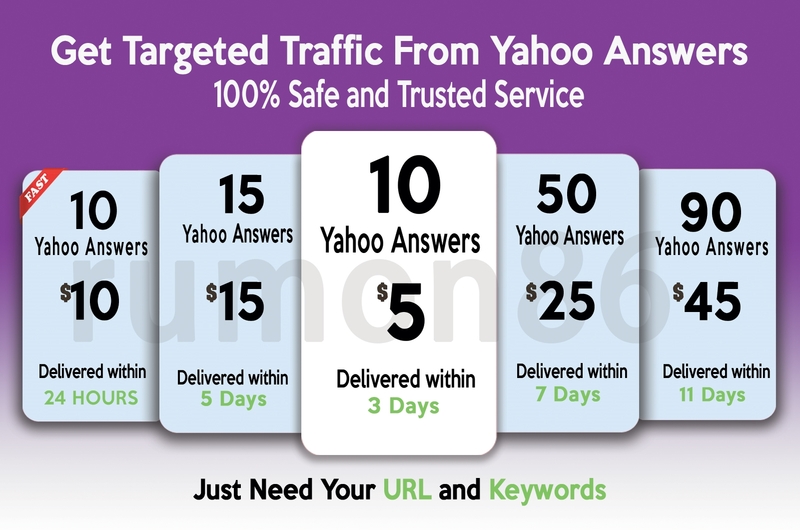 So get listed your website in Yahoo Answers and get targeted traffic to your website. If you want to promote your website in Yahoo Answers you should take this service. NOTE: I offer 100% money back guarantee if you're not satisfied. So order with confidence now! If the seller fails to deliver the service in the specified time, the order will automatically cancel returning your funds. Promote your website in 10 Yahoo Answers with Clickable link is ranked 5 out of 5. Based on 149 user reviews.